With Valentines Day around the corner, love is in the air. I thought it might be fun to give you ideas on how to show your hobb (Arabic for love) in another language this year to be different. 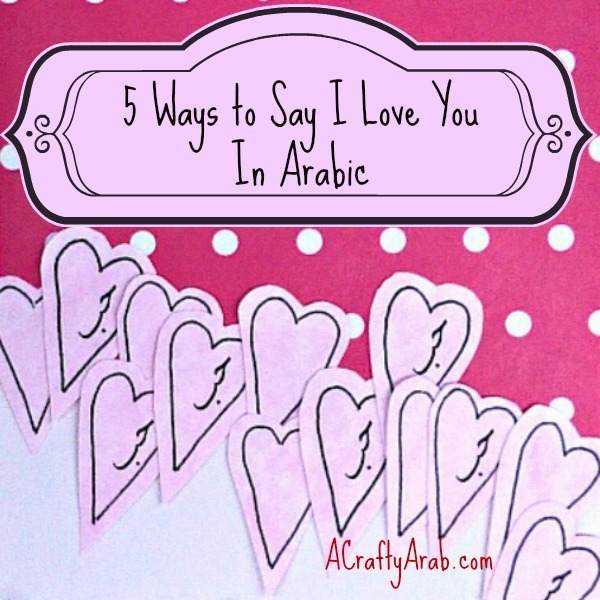 Here are 5 ways to say I love You in Arabic. Arabic is an Afroasiatic langauge, and similar to it’s Semitic siblings, nouns change depending on if you are talking to a girl or a boy. Arabic is comparable to French, where nouns ending in -e tend to be feminine, or Irish, where nouns ending in -óir/-eoir and -ín are always masculine, and those ending -óg/-eog or -lann are always feminine*. In Arabic, we use diacritics because our language is adjad. We place a Fatḥah above a letter and a Kasrah below to determine the grammatical gender. The Arabic word for I is Ana and the word for Love is Hobb. So placing the two together is Ana Hobb, but you need to also add an ending depending on who you are addressing. أنا أحبكِ – ana ahobbuki. أنا أحبكَ – ana ahobbuka. أنا أحبّكم – ana ahobbukum. There are also different ways to say I love you in different situations, from love in the Bible to love for a lover. You can also hear some of them here.Or use this graphic. I started my business eight years ago because I couldn’t find cards to give my loved ones that were in Arabic. Since then I’ve created many options for others to send some love. Here are some cards that I made in my studio this week that will all be listed in my Zibbet shop soon. Mohammed Foaud is an Egyptian vocalist who has a wonderful Arabic love song called El Hob El Haqiqi, which translates to My Love That Is True. Teaches us how to forgive and to forget about yesterday. Teaches us to constantly think about the forthcoming days. Umm Khalthom is another Egyptian vocalist who also has a fantastic song called Night of Love. I remember many nights listening to this coming from the radio in our house. A saying of the past was “A way to a man’s heart is his stomach” but honestly, doesn’t food work on just about anyone? Valentine’s Day is in February, which tends to be a dark, cold month for us. For dessert, you can even try some Baklawa Pops. Looking for some poems to read to your loved one? Check out my book section in my Amazon library (I’m an affiliate member). If you are looking for love poems to read, grab this book to serenade your hobb. There are so many ways to say I love you in Arabic. I hope you try one of them this Valentines Day! *Grammatically there are always exceptions to these rules and endings for all languages. Please check a dictionary or local dialects to verify.